Sometimes first impressions can be the deciding factor when plopping down a pile of cash for a tool when all your needs and specs. are met. My first impression was "FAR OUT!!". (Go ahead, date me.) I'd seen the ads but those maple handles just sort of jump out at you and say "Grab hold, sucker". The next thing you notice is the weight. It just doesn't feel hefty enough for a 2-horse router, like you could use it all day and then go stack wood (guess what I'm doing). Magnesium, baby! It's tough, light, and matches the rest of the excellent fit and finish of the tool. Of course, you just have to take it apart-- without even breaking out the manual, naturally. But wait! Where's the thumbscrew? What those very expensive ads don't show is the mechanism for removing the base from the motor. This is done by opening a cam-type base clamp lever, depressing the course adjustment lever, which releases a foot (arrow at left) and sliding the motor out until it stops. You then turn the motor counter-clockwise and gently pull it free from the base. Sound complicated? Trust me, you very quickly learn the procedure and never want to see another thumbscrew the rest of your life. There are even arrows on the base and motor you align to help put it back together again. Never seen anything like it. Very cool. When changing bit height, the motor has 3 course adjustment notches, 1/2" apart, that can be set with the course adjustment lever. Depending on the bit and the desired depth of cut, final adjustment is controlled by a true micrometer adjustment mechanism. There seems to be a little play in this mechanism, but I think once the learning curve kicks in, this is a non-factor. As with any new tool, experience is the best teacher. My good friend and sometimes neighbor is Jim Mattson. We did some testing on the claims Bosch makes for this router and were quite surprised. We wanted to see how accurately a bit stayed centered when changing it's height. As you can see by the picture, the router was secured to the locked table saw fence with the dial indicator secured to the table saw top via it's magnetic base. 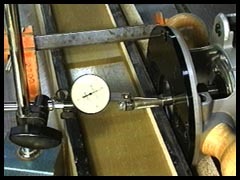 Using a 1/2" straight bit, we zeroed the dial gauge just above the cutters on the bit. We then moved the depth of cut about 3/4" and took a measurement just below the collet. Result: .0013" difference. I really don't even know what that looks like but it sure does sound like not much to worry about unless you're building a space shuttle. Jim and I are both "need to know" types, so we decided to put another router through the same test. We used Jim's 15 year-old Porter-Cable Speedmatic which spirals down instead of dropping straight. Result: .0020 difference. What I see in the results of these tests is neither a selling point for Bosch nor a cause for concern. Incidentally, bearing run-out for both routers was about the same. The router has a rocker-type "On/Off" switch located on the side of the motor housing. I prefer a trigger-type arrangement as it eliminates accidental start. The EVS model has a soft start feature that is pretty much the industry standard today. As far as noise is concerned, I turned on my Freude 2000e plunge router and couldn't hear the Bosch running right next to it. Relatively quiet, but of course ear protectors should be worn. The variable speed control is located at the top of the motor and is easily accessible. Speed can be changed while the router is running. The Bosch has a standard 2 wrench bit changing collet, which uses a two-step catch system when loosening a bit. Those beautiful handles are located at a low center of gravity for maximum control of this lightweight machine. The finish on them could use a little work. The sub-base. Oh my, the sub-base. One of the first things I did was take a straight-edge to the plastic sub-base. It was concave to the base by about 0.020" on each side. In my humble opinion this is unacceptable. When routering this can cause a rocker effect that makes precise joints impossible. This is not to mention the extra sanding required on a simple roundover operation to eliminate the "wavy" effect the base would produce. All of the time and money spent making the base and motor true is negated by this flaw in the sub-base. Let's hope it was a bad batch. This same sub-base IS adjustable to allow precise centering of the base and template guides. It requires an optional centering cone; the excellent manual gives a good description of the procedure. There is a "Deluxe Router Guide" available as an option. It features a fine adjustment mechanism for exact precision routing, whatever that is. I prefer the spacer block- straightedge method so this would be something I could do without. Both work well. I tested the router in most basic operations: rabbeting , dadoing, dovetail, roundover, edge and cove. The results were excellent in all operations except where the sub-base could make the difference between a ''good" cut and a "excellent" cut. In a step-down rabbiting test the results showed the flaws of the concave sub-base more than on any other test. All tests were conducted on red oak at 11% moisture content. I'm going to buy one of these tools, period. The cam-type base clamp mechanism, the light weight, and the fit and finish make it a joy to use. The sub-base problem can be taken care of with a piece of 400 grit sandpaper and a sheet of glass. On a scale of 1-10, I give it a 9-----haven't seen a 10 yet. The Bosch model 1617EVS router is 120 volt, 50 - 60Hz, 2 HP, variable speed, 8000-25000 rpm no load, 11 amp, with 3/8", 1/2" and 8mm collet capacities. Made in the USA. I found this router to be light, easy to handle, powerful for its size and accommodating to its accessories. The variable speed, soft start motor was easy on soft wood, yet powerful enough to handle the hard woods. The first use I put this tool to was making a small cedar box with flush dovetail joints. The light weight of the router made following the contours of the dovetail template a breeze. I adjusted the motor speed until I felt the rpms matched the wood. The quick-change template guide mechanism is by far the easiest that I have ever used. Template guides can be changed in seconds. It appears that the bracket is out of the way enough to remain installed on the sub base through most routing jobs (photo at left). After dealing with the soft cedar, it was time to get tough. I dug a piece of hardwood out of the scrap box and clamped it securely to the bench. I chucked in an old, dull, 3\4" straight bit, adjusted the router speed to maximum, and let her rip. When the smoke cleared, I had truly ruined the bit. I quit before the router overheat switch tripped (I assume it has one) because I just don't like abusing tools. Yes, the motor bogged down, but the router proved to be very strong. There is no hardware securing the chip deflector to the base. It snaps in and out for better access to the collet chuck area. The two step height adjustment system on this router is straight forward and easy to use. The coarse adjustment locks the motor to the base in one of three positions. The fine adjustment system is a micrometer type knob with English and Metric graduations. One full turn of the fine adjustment knob is equal to 1/16". The noise level of the motor is equal to or slightly less than that of a similar sized router I have, and is not a detriment. Ok, now for the down side. Although the fine adjustment system does give the operator the ability to make fine adjustments easily, there is a lot of play in the mechanism. Occasionally, I turned the fine adjustment knob almost one full revolution before the depth setting changed. With both the coarse adjustment lever and the base clamp lever fully locked, there is plenty of play in the fine adjustment knob. The handles on this router are wooden spheres, similar to the front handle on a jack plane. I did not feel as in control as when using routers with "d" handles, but this just may be a personal choice thing. The on/off switch is located high up on the motor. The router must be held by one hand as the other hand operates the switch. The soft start feature almost completely removes the possibility of the router getting away from you, but I did not feel entirely comfortable with this arrangement. In summation, this is a quality tool made by a reputable manufacturer. There are many features that are definitely assets to the operation of this router. It will give good performance in any job that it was designed to do. The few items I found not to my liking may not be an issue to someone with other tastes and experiences. I didn't get the chance to live with this tool as long as Ken and Jay, but I did get some first impressions. This is an excellent router! The weight-to-power ratio, the cam lock, how quiet it is and those "you gotta love" clear-finished maple knobs make this router one of the best you can buy . Even though I have seven routers, if it weren't for one thing, I would go out and buy one too. The problem I had was with the height adjustment mechanism, as mentioned above. Those of you with older Bosch routers are familiar with their base which uses a spiraling, inclined ramp to adjust height. As you twist the router, a cursor follows the index marks on the ramp allowing simple, quick and very accurate changes in bit depth in either direction. Next to Porter-Cable's indexing slip ring, which you can zero, the Bosch setup was the best around. With their new model, Bosch abandons this tried and true method for something very complicated to use and more expensive to make. The Micro-adjustment knob has so much play, the lost motion has to be removed before making any adjustments. Pros who use this router every day will no doubt adapt, but it might be confusing to the weekend woodworker who only occasionally uses this tool. In my humble opinion, had Bosch kept the older height-adjusting setup, this router would truly be a 10. Editor's Note: Ken Sharp and Jim Mattson are professional woodworkers; Jay Towles is an amateur woodworker. The router was graciously donated to Jay for this review by Todd Mogren at Coastal Tool. Coastal sells this router for $179 - click for details.